It’s true. In this city of bitter transplants, even with a few Ducks and Sharks swimming about, our puck pulse is commanded by the L.A. Kings, the same way hard-court hearts beat for the L.A. Lakers, and Los Doyers capture baseball corazónes. Initially I thought there had been a copy mistake. Surely, these folks meant to put “Handcrafted in California,” or “SoCal,” or even “the Sky,” if you’re inclined to follow the metaphor. But when I visited the Galaxy’s website ahead of their opener, I saw more of the same. The problem, of course, is that the L.A. Galaxy doesn’t exist. It’s not just because this is the fickle sports fan capital of the world. It’s because the closest the Galaxy have come to being the L.A. Galaxy was when they were the Pasadena Galaxy, playing their first seasons in the Rose Bowl. This is not a simple geographic blunder. Let me quote Angel Mendoza, my future brother in the stands, from Howler’s recent piece about the last Chivas USA game: “I tried going to a few [Galaxy] games but they seemed so corporate. They didn’t listen to us fans, or care about us. They’re Hollywood.” For all of its success, much of the city does not see itself in this tinsel town team. These bright blue L.A. days all seemed so dreary. Then, out of nowhere, LAFC fell from the sky. I am a proud part of what I will claim to be the most thorough fan base for a Premier League team in the USA but I long for more. It’s great that the L.A. Gooners can organize a successful charity fundraiser in which 25 people run 3.9 miles on a non-match morning for a charity 5,437 miles away. But it’s a shame that those same people won’t drive 25.7 miles to watch a match unless Thierry Henry is playing his last game in Los Angeles. Wait. What? These billionaires are asking for help? I took that statement literally. Zoolander-level literally. 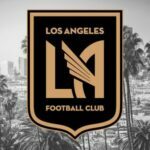 LAFC’s ownership may have a net worth of $4.5 billion but, seeing as the team is mine as much as it is theirs, I decided it was my duty to prepare a briefing on LAFC’s gold-rush-grade opportunity to leverage this soccer-schizo city. So, could someone with billions of dollars generate fervor in such a fickle and fractured city? Did I mention the billion(s) part yet? The first priority is making the ground as accessible as possible. The Staples Center works because so many transportation veins — including the (finally) expanding metro — funnel right into it. Downtown is a people magnet; the plains of Carson are not. Stub Hub Center is the largest soccer specific stadium in the country yet rarely full. Among west coast teams, the Earthquakes, Sounders, Timbers, and even Real Salt Lake all manage to fill a greater portion of their stadia. So think smaller and more compact. You don’t need a soccer compound like the one in Carson. Keep the moat between seats and the pitch slim. I promise not to storm the pitch until we knock the Galaxy off their perch. Tilt the seats steeper. Give it a theater effect. Have a reasonably priced safe standing section. Think Highbury mixed with the Westfalenstadion. 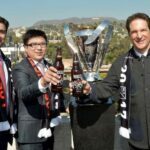 Thus far, LAFC’s biggest faux pas took place at the club’s ribbon cutting, when the club was christened using a celebratory commemorative beer made in Portland. L.A. was late in hopping onto the craft beer stool but our scene is strong. Angel City, Eagle Rock, and Highland Park breweries are all actually handmade in Los Angeles. They’re also delicious. Golden Road already works with Heal The Bay and L.A. River Revitalization. Tap into this community for the club’s commemorative craft bevvies. Big-money, no-whammy beer sponsors may be tempting but let us have our own city’s suds at the concession stands. Your chosen red, white, and black aren’t far off. But red and blue have a touchy history in this city, both in the siren and sign categories. Why not blend them together instead? Orlando FC beat us to the obvious purple and gold punch. Since their crest got lost at a medieval fair, let’s say that was for the best. Instead, go with silver and black, like our King and, in all likelihood, returning Raider brethren, but with purple trim. Add some stripes — MLS could use more hoops — and it’s a wrap. Let’s take this opportunity to rework the American Sports Game playlist, shall we? In a city that is home to the most innovative music scene in the country, if not the known universe, “We Will Rock You,” “Eye of The Tiger,” and top-40 pop hits just don’t cut it. With the legendary Low End Theory club night as the bullpen, every soundscape you’ve ever needed can walk right down Broadway into LAFC speakers. Might as well just employ Flying Lotus to compose a match day music program and original theme song. Think Star Wars con G things. Either keep what you’ve got or let L.A. native David Choe have at it. The maniac muralist would probably whip up something designed to dizzy any opponent who dares stare directly at the crests on our kits. (Now you see the hypnotic bonus of hoops.) At least let him paint the walls outside of the stadium. I’m sure you could even incorporate sponsors in a more creative way than obnoxious, depressing signage. Hire the L.A. Son himself, Roy Choi, to be in charge of all food inside the stadium. Not only did he fuse Mexican and Korean cooking — interior L.A.’s two most ubiquitous and diametrically opposed cuisines — with his Kogi taco truck, his new restaurant Pot proves he cover the finer-dining savvy suits who won’t know where to slink without the LAFC luxury boxes (reminder: they won’t exist). Have L.A. record label Delicious Vinyl’s new pizza venture, Delicious Pizza give out free slices when we deliciously slice our cross-town neighbors apart. Invite L.A.’s fleet of food trucks to park outside and serve tailgaters. This will hopefully hasten the mobile culinary world’s long-overdue beer truck revolution. Do not, under any circumstances, change the name. Avoid at all costs the ’90s-era cacoethes to Disneyfy sports teams. LAFC is perfect. 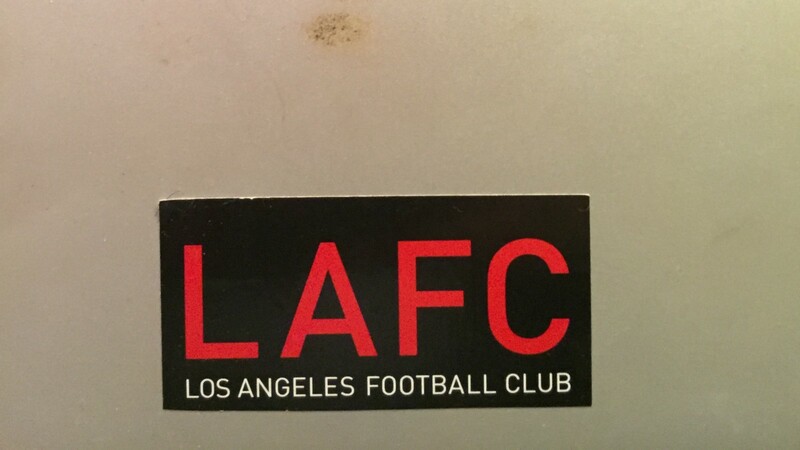 LAFC is Los Angeles. Try as we might to shake Hollywood’s chokehold on our image, famous people will eventually find their way through our turnstiles. The Lakers have Jack Nicholson. The Kings have Will Ferrell. The Dodgers have Alyssa Milano. The Raiders (I already mentioned they’re coming back, right?) have Snoop Dogg. We will inevitably have to choose ours. Don’t let it be Drake, dear billionaires. Is there a legal way to bar him? Yes, that, but also actually strike him with a metal bar? Canada needs us! Please, in the name of all things holy, don’t get in bed with the same old big businesses. Tap into LA’s burgeoning tech market. Tinder Field might not work but I’m not against Snapchat Stadium. You could also go for the heart and Sawyer with Tom’s Stadium. Maybe they will build a stadium for a community in need? I hear Las Vegas is desperate. Please support the supporters. The rivalry is already there for us. The songs write themselves: the most successful club that no one cares about, the softest fans in sports, Orange County jokes. This club will be our church. Like crossfitters gathering for gluten-free fritters, we will congregate outside the stadium for extracurriculars. It’s 2015 and the soccer fan isn’t as boneheaded as the baseball fan. Being right in the city, we parishioners will be impassioned about our city and the community and, in all seriousness, we’ll have the potential to do a lot of good, maybe even help ease gentrification’s ulcer on our city innards. We will be the hooligans 3.0, abandoning both the violence and the sofa and looking to use the game for good in our own ‘hood by being present. Get our backs. Look, I’m not going to tell you how to make money. You seem to have that part of your lives under control. 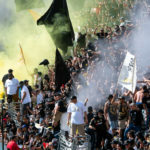 What I am telling you is that you can galvanize L.A.’s sizeable, soccer-spangled public that, until now, has shown little interest in the football on offer. But that will change. Give us our Kings to their Ducks. Give us our Dodgers to their Angels. Gives us our Lakers to their Clippers. No, really, they can have them. The Carson Clippers has a nicer ring to it anyhow. Do these things and you will get your True Angelenos At Last headline. Ignore them and you will go the way of the Goat. P.S. Tomas Rosicky will probably be ready to retire from Arsenal by our first match. What’s say we sign him up early? P.P.S. I am getting an LAFC tattoo in the place of a planned Arsenal one if you do at least two of these ten things. P.P.P.S. Okay, maybe the tattoo will go right below it. Unless you hit all ten.